How funny that the "art" part of this book is what made it difficult for you! Sounds like a great read, though! Sounds like it's worth picking up, too bad the "art" part was straining though! Yes! 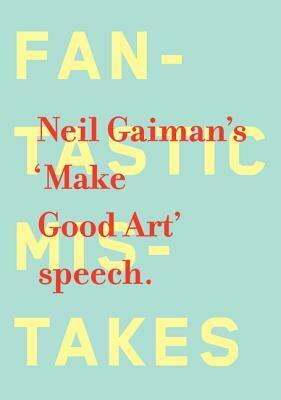 The speech part of it is really good, especially if you’re a Neil Gaiman fan. How weird that the fonts were in colors that made it difficult to read. That kind of defeats the purpose, doesn't it? It does sound interesting though! I'll have to look it up on YouTube! That's how I ended up "reading" The Last Lecture too. Great review! Yes! Please look it up on YouTube. It’s a very good speech. I hate it when a book gets ruined by trying to look pretty. I will have to look his speech up. It sounds like this one is inspiring and actually like the type of thing I would like, but the format is going to make me pass. Why wouldn't they just make it normal, so that it is easier for everyone to read? Such a let down :/ But those quotes were wonderful.